As a new field, we are only beginning to figure out how to design smart contracts. Should we harness the underlying technology properly; it has the potential to become both an incentive and deterrent. Particularly, as we look to embed many types of self-executing clauses into the contracts we deal with, making breach more difficult and streamlining business to save money and time. For instance, it is possible to design smart contracts that automate order fulfillment or discharge legal obligations. Such as delineation of property rights, or handle premiums and payout. In theory, smart contracts could even be used to program all kinds of financial agreements, where placing contracts on a blockchain could control access and build trust into transactions, from derivatives to escrow accounts to instant auctions. However, as we look to new applications, there are serious issues that must be addressed before smart contracts can reach their full potential. Case in point, experts from the National University of Singapore and University College London recently published a study, in which they analyzed 3,759 smart contracts and determined that roughly 3.4 percent–a stunning figure when applied across an entire enterprise–were vulnerable to manipulation by bad actors to permanently lock funds, force random leaks, or kill them altogether. Of particular concern is the threat vector represented by oracles–data feeds provisioned through a third-party service–which find and verify real-world occurrences, and submit this information to a blockchain to be used in smart contracts. Quite simply, smart contracts need to be even smarter. Improvements are necessary to reduce the work involved, achieve stronger immutability and improve performance. A new vanguard of companies is rising to meet this challenge, developing easily used tools and built-in security to fortify smart contracts against attack. Established players are also working toward better reliability and functionality with enclaves and trusted code. Hyperledger, the Linux Foundation’s open-source Sawtooth collaborative, is now supported by a growing list, including Intel, IBM, Amazon Web Services, Huawei, Microsoft, and Ericsson. Smart contracts, while they promise to unleash efficiency and reduce the complexity of conducting business, also face technical limitations and challenges. The accuracy of encoded functions, and by extension their usefulness, has been brought into question, suggesting that a more intelligent approach is needed. Intelligent contracts, a developing field often referred to as Smart Contracts 3.0, offer a new model that is more extensible, flexible and responsive. While, like smart contracts, they leverage distributed-ledger technology to store immutable information or actionable events within a public or private blockchain. Intelligent contracts differ in important ways. Applying artificial intelligence (AI) to identify and extract key information from contracts, a methodology pioneered by Seal Software, they can be taught to actively learn from user responses and input, to continually improve the extractions and predictions they make. Rather than encoding the contract and placing it on a block, after consensus has been reached, intelligent contracts create an identification data (ID) of a particular contractual clause and add that to a blockchain instead. The deep analytics embedded in intelligent contracts are a matter of great interest among legal professional. Who for example, can use them to instantaneously initiate and analyze a contracting system across an entire contract corpus. Rather than looking for ways to simply re-engineer the weaknesses of smart-contract coding and design, Seal is interested in the flexibility of the data itself and applying real-world analytics to the information encoded in these contracts. Both are compatible and harmonious. Current mainstream discussion is dominated by the transfer of cryptocurrency, triggered by a smart contract, and the loopholes hackers have exploited. These examples are necessarily straightforward – if event X happens, then transfer Y sum of crypto from one party to the another. However, in more complicated transactions, the scope for failure is more acute, and greatly magnified when considering complex financial transactions like a QFC or an MSA for an infrastructure project. When we talk about intelligent contracts, we are referring to coding key metadata and KPIs–such as payment terms or termination notice periods–onto a blockchain so that each party, no matter how many there may be, can subscribe. Restoring digital trust for in-house legal, general counsel or procurement teams, as well as security, technology and IT departments teams, tasked as they are with data security. Ambiguity is removed while keeping the actual clauses and the actionable data off-chain. This hybrid model serves several purposes. It avoids the block-size and performance limitations of blockchain, and the off-chain storage option supports the capability to learn and analyze contract versioning, categories and the interrelationships between contract documents such as change orders and SOWs. Perhaps most importantly, it obviates the need to encode highly ambiguous clauses. This is because smart contracts are encoded as conditional expressions, which works well when options follow distinct IF-THEN-ELSE patterns, but is unable to address ambiguity. Consider a very common clause in a procurement contract. Where a supplier must “deliver the product that is acceptable to the buyer at its sole discretion.” Often this is a clause forced on the supplier because the customer demands that their paper is used as the template, yet it is impossible to encode the ambiguity of what is deemed ‘acceptable’. One of the design tenets of Ethereum, the most prevalent platform for smart contract execution, is that of immutability. Once the contract has been encoded, it cannot be changed without the consent of the other participants in the permissioned distributed ledger. Therefore, “coding to grey” is required. This is borderline impossible, as every potential outcome must be catered to in the code. There are plenty of other examples. Read a few contracts and it is easy to spot clauses, which are either blatantly ambiguous, or, at best, still open to different interpretations. To encode these clauses into a smart contract, ambiguity must be eradicated. There are two possibilities. One way is rewrite contracts to be so watertight and buttoned-down that all ambiguity is removed. 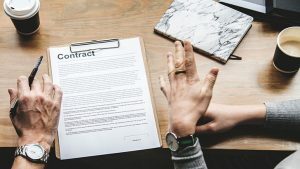 Given that the enterprise leaks nearly 10 percent of value out of contracts that are poorly written, tightening up contractual language is obviously an ideal way forward. In practice, however, there will always be ambiguity, whether it lives in existing contracts or comes as a result of post-contract execution. Another option is to implement an intelligent contract platform, that takes ambiguity into account by encoding contract metadata, but not the actual clauses. With this approach, clauses and actionable data are maintained off-chain, breaking the relationship between data and metadata. This also offers important security benefits, not the least of which is fully auditable data integrity. In particular, as a data-governance tool for risk and compliance–GDPR comes to mind–the off-chain aspect of intelligent contracts makes it possible to maintain data privacy since only metadata, simply “pointers” to the data itself, live in the blockchain. The data, or even just fragments of such information, will remain only with the original off-chain contracts. As a source of business transformation, intelligent contracts also give contract holders the ability to apply AI analysis models to the data off-chain. The result is better predictive insight and more precise ways of understanding opportunities to not only save money and time, but truly generate real and lasting value. Seal Software Contract Discovery and Analytics helps companies maximize revenue opportunities and reduce expenses and costs associated with contractual documents, systems and processes.